Britto Charette is a luxury interior design firm located in a well-known spot for devotees of contemporary art: Miami’s famous Wynwood design district. They are currently using the Form 2 SLA 3D printer to prototype and create sales collateral to help communicate their ideas with manufacturers. After only one month, the Form 2 has become an essential part of Britto Charette’s design workflow. Cast Ceramic and Gold Vases. Known as Britto Charette since 2010, the company does interior design and builds the actual pieces for their clients. 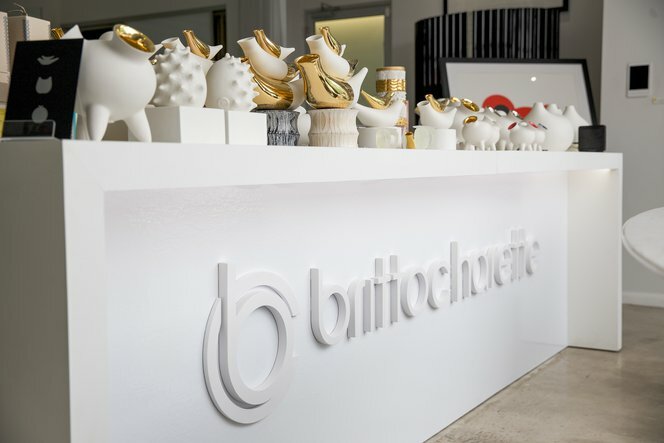 Britto Charette recently started a new line of home products, which primarily consists of vases but includes some small sculptures. To create these pieces, they first prototype using the Form 2 and make the final product from combining cast ceramic and gold. I used to use another FDM printer, which was not smooth and imprecise. SLA gives us better precision and is much better for sanding. Before turning to 3D printing, Britto Charette was using clay and an onsite carving wheel, but they needed someone to translate the idea to the carver. To make changes to the model, they had to send 2D drawings to off-site manufacturers. With 3D printing, they could create a new prototype in just a few hours, making their workflow more efficient. Statue 3D Printed on the Form 2. Before it was hand-carved, it was really messy. It was more time-consuming than anything. Susel Aleman Legra explains the design process using the Form 2. Their previous design process was complicated and labor-intensive. With the Form 2, Britto Charette saves time and money. Now, they can show clients physical designs instead of drawings. The client has a better understanding of what the final product will look like. Founder Jay Britto discusses how 3D printing has impacted his business. We really need the Form 2. It’s something we can’t afford not to have. We got rid of our pottery wheel—there’s no more buying plaster or any of that stuff. Table prototyped on the Form 2.